At a drive-up ATM, keep all windows closed except the one you are using, and all vehicle doors locked. Keep the vehicle running and watch the vehicle's front, rear, and sides. If someone approaches your vehicle on foot, cancel the transaction and leave. If you drive to the ATM and then exit your vehicle to use the ATM, lock the vehicle doors after you exit it. Keep your keys handy so you can re-enter your vehicle quickly after completing your transaction. When approaching the ATM, be alert for anything suspicious, such as two or more people in a nearby vehicle or someone "hanging around" the area, especially if no one else is at the ATM. If possible, try to use the ATM during daylight hours. After dark, avoid using an ATM with shrubbery, etc. that prevents a clear view of the area. If the area is not well lighted or the lights are out, don't approach the ATM. When waiting in line to use the ATM, wait well behind the person ahead of you, and don't approach the ATM until he completes his transaction. 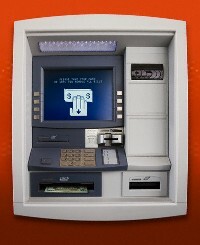 If someone is closer to you than you would like them to be while you are using the ATM, ask them politely to step back. If they don't move back, cancel your transaction and wait in your locked vehicle or other safe location until that person leaves. If necessary, go to another ATM. Before you approach the ATM, have your card ready, know your Personal Identification Number (PIN), and have all deposit slips, etc. completed. If you need to get a deposit envelope from the ATM, take it back to your vehicle or other safe location to complete. You can also maintain a small supply of deposit envelopes at home, in your car or office. Prepare all transaction paperwork prior to your arrival at the ATM site. This will minimize the amount of time spent at the ATM. Memorize your PIN and do not write it on your ATM card or carry it in your wallet or purse. Select a PIN that is different from your address, birth date, SSN, etc. Don't tell anyone your PIN. When using the ATM, stand directly in front of the keyboard, blocking the view of anyone nearby. Do not enter your PIN if anyone else can see the screen. Criminals can use high-powered equipment to visually capture a PIN as it is typed in. By sorting through discarded transaction receipts, they can match PINs and account numbers and have all the information they need to manufacture false ATM cards and gain access to a person's money. Never accept offers of assistance from strangers. 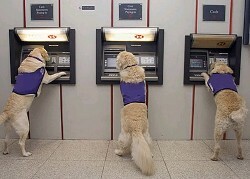 If you are having problems with the ATM, contact the financial institution. When you've completed your transaction, put your card, money, receipt, etc. in your pocket or purse and leave immediately, being aware of your surroundings. Do not stand and count your money. If the transaction was incorrect, you can't do anything now, so don't put yourself in danger.